In Part 1 of the search for Nobu Ina, I wrote what we know about Nobu through her letters to my Grandfather William (Will) Liming Redles. Part 2 was about my own research into her whereabouts in the U. S. I learned from her alien registration form that her married name was Hatano. In Part 3, I discussed finding her husband, Hisatane Hatano, and what I was able to find out about him. I was hoping he would lead to more information about her, but he didn't. Not in what I've found so far. Below is the location on Google Earth and a Google Street View of where Nobu and her husband were living according to her alien registration form and his World War II draft registration (see Part 3). I meant to put this in Part 3, so I thought I would show it here. 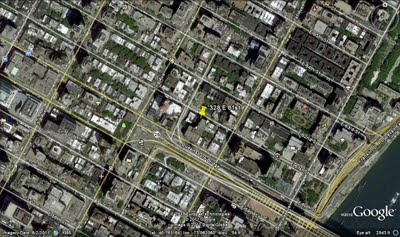 The yellow push pin marks the location of 328 E 61st Street where Nobu and Hisatane Hatano were living at least in the early 1940s (from Google Earth). 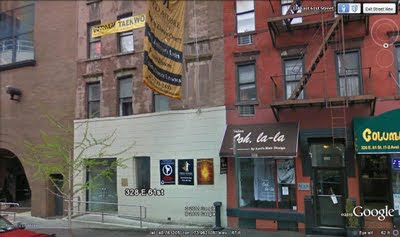 Google Street View of 328 E 61st St. in New York City (the building with the white street level facade). Another avenue that I went down was researching the Sterling Pile family, the family for whom Nobu worked according to the 1930 New York census (see Part 2). If you'll recall from Part 1, Nobu wrote to Will in 1925 while she was living in Los Angeles, asking him to find her a place to work in the east so that she could improve her English. She writes, "Could you not find a suitable home work [sic] for me from about next year or so in the East" (emphasis in original). Did Will know Sterling Pile or his family; did they have mutual friends? I haven't found any letters from Nobu that mention going to New York. I also haven't come across the Pile name in any of Will's correspondence that I've had the chance to read. I wondered if Sterling Pile could have been in Japan at the same time as Will and could have met him there. Will was friends with an American businessman, Thomas M. Laffin, who was living in Japan. Maybe Sterling had dealings with Thomas Laffin and that's how he came in contact with Will and Nobu. I found a passenger record for Sterling returning to the U. S. from Hong Kong in 1914, and there are several other passenger records for him on ancestry.com but none to and from Japan. One thing that might be purely a coincidence is that in one of my father's stories about Miki Koto (i.e., Nobu Ina; see Part 1), he uses the name "Colonel Sterling" for Will. Had he seen this name in Will's correspondence and chosen it for his story? I looked at several records online pertaining to Sterling Pile. I found him in the 1910 and 1920 censuses, found his World War I and World War II draft records, and family trees on ancestry.com. Before I obtained a copy of Nobu's Alien Registration form, I recorded every address after 1930 that I saw for Sterling Pile, preparing myself for the release of the 1940 census (in 2012) in case Nobu was still with the Piles in 1940. I looked at the names of his neighbors listed in the 1930 census to see if any were familiar. Basically, I looked at anything that I could get my hands on to look for clues. I even tried looking up his two older children who were 14 and 11 in 1930 when Nobu was living with them. I thought they were old enough at the time for her to have perhaps made an impression and therefore might remember her, but they have passed away. I found the 1930 Sterling Pile residence labeled on a 1931 Sanborn Fire Insurance map that I obtained through a colleague of mine. 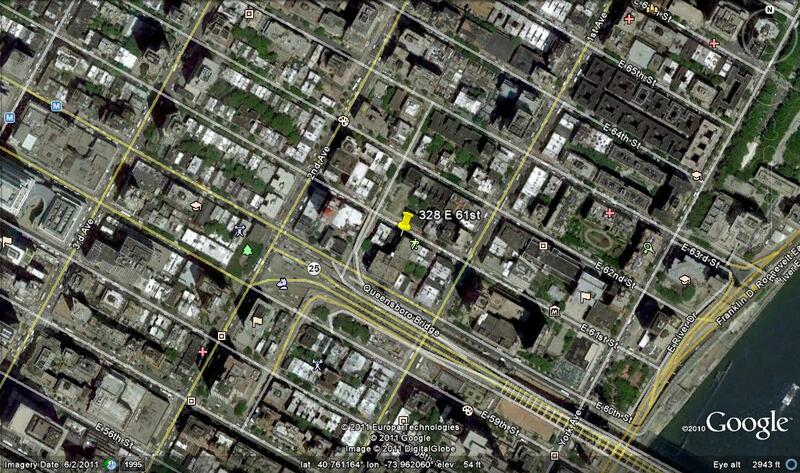 Then, out of curiosity, I looked up the location in Google Earth (see image below). 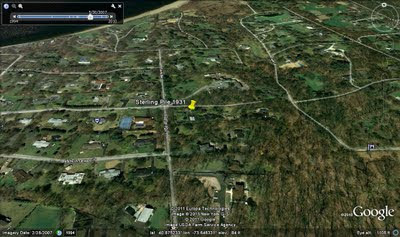 (You'll notice the time slider at the top left of the Google Earth image. You can choose a time period for a different/better view. I chose 2007 when there doesn't seem to be so much foliage in the way as there is in the most current  view.) There are (surprise, surprise) no Google Street Views of this area. I spent some time comparing the property in the Nassau County property records with the 1931 Sanborn map. (The house faces Tower Road which intersects with Red Spring Lane to the west.) I'm fairly certain that I have the correct house marked below; the 1931 Sanborn map shows a house to the west of the Pile residence, but there is no house there now--just an empty lot. 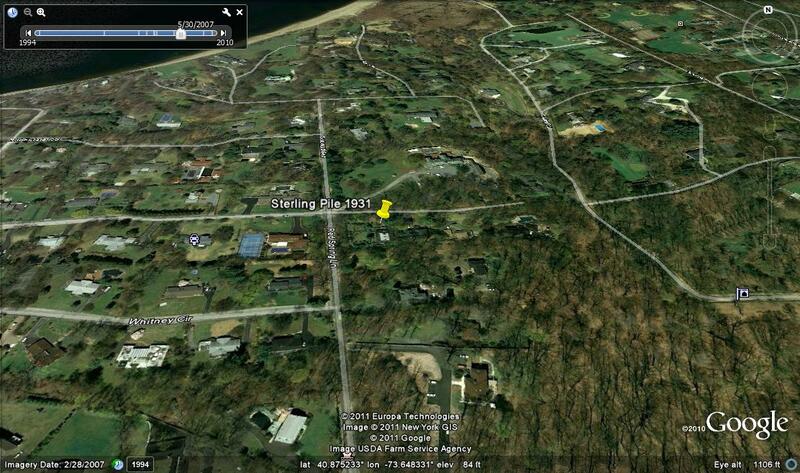 Probable location of Sterling Pile residence on Long Island as labeled on 1931 Sanborn map (image from Google Earth). His address is noted as Red Spring Lane in the 1930 Glen Cove, Nassau County, New York census. See Part 2 for census image. I searched for Thomas Laffin, too, just grasping at straws. In some of the letters I've read, Thomas seems to be Will's confidante. A message board entry on ancestry.com says Thomas died in Japan in 1931 (go to bottom of that page for the English translation). I have wondered about making contact with a descendent of any of the people who were close to Will and who might have any information about him and his dealings in Japan in their family papers, but I haven't yet come across anyone with whom to correspond. In Part 2, I noted that my Aunt Catherine told me that in the late 1960s she found out that Nobu might be involved with the Methodist Church in New York City. In a Google search, I came across the Japanese American United Church in New York. On their History page is a photograph of the congregation labeled "Japanese Methodist Church/Easter 1938" (click the church name above to go to their website to see this photo). I wonder if Nobu is in that photograph. I've thought about writing to the church, but I don't know what I hope to find out. They wouldn't be able to tell me whether or not she was Will's daughter, but maybe they have a record of their congregation from the 1930s, '40s, and '50s and can help me add another piece to her story. Once I found out Nobu's married name, I searched the Social Security Death Records again but found nothing. However, if she didn't work outside the home (her alien registration form said she was a housewife), she might not have ever applied for a Social Security number, so there would be no death record. I haven't yet found an obituary for her either. In 2009, I posted on the ancestry.com message board for Aichi, Japan, where Nobu is from, but I've received no replies. This will be the last part of the series of the Search for Nobu Ina for now. This has been a good exercise for me; writing it all out has helped me "get my ducks in a row." 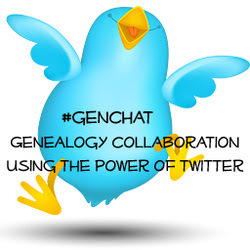 I don't want to give the impression that I think all genealogical research can be done online. A lot of it can be found online through genealogical websites like ancestry.com and familysearch.org (and others, but these are the two that I use), historical society websites, or national and state digital archives, and many more. For someone like me, living so far away from all of the places where the people that I research lived, these types of websites have helped get me started, and in some cases, I've had to look no further. There are millions of historical and genealogical records online, but there are millions more that aren't, I'm sure. Sometimes you need to do some "old fashioned" footwork and go to these places and visit the libraries, archives, courthouses, etc. I've told my youngest sister that we should plan a research trip to New York to continue our search for Nobu...if only money grew on trees.